"Dandelion" comes from the French word "dent-de-lion" meaning "tooth of the lion" and is actually a member of the Sunflower family. Who knew a weed could taste so good? Though often considered an obnoxious find in one's yard, dandelion greens are a major score in the nutrition department. These leafy greens are chock full of vitamins and minerals while also turning up low in calories and high in fiber. A versatile green with flavor and health benefits? Sign us up, please. Switch up the kale routine with this other nutrient-packed green. 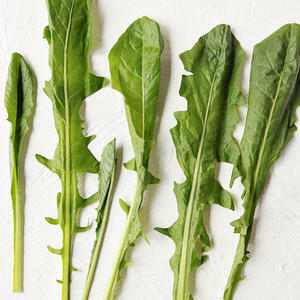 Dandelion greens serve up a healthy dose of calcium making them an alternative option appealing to vegetarians. Vitamins C, A and K all have a strong showing (helping your blood flow, skin and vision health) along with the antioxidants Lutein and Zeaxanthin (also healthy vision supporters).